So, yesterday was payday, and so today, once again, I have no cash, but unlike decades gone by, today my goals and dreams are nudged forward. It is all thanks to the financial planning and tracking system that I have developed and refined. Let me go over with you now, what it has become. It starts with my spreadsheets, I have two versions of this: one is for my first payday of the month and the second one is for the second payday of the month. One budget covers the payday cycle that I am in now, and the other one covers the next payday cycle. Depending on where in the month that I am, will determine which one is current and which one is the next one. On payday, I budget out both the current payday cycle budget and the next one. 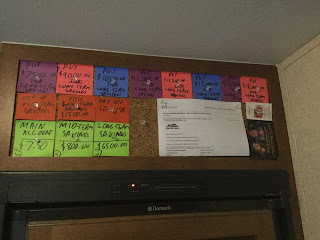 I do this so as to not only plan but to motivate myself; if I am good this pay cycle, then I can achieve this much more in the next pay cycle. To stay on budget I have my wallets of cash that I use to pay for my day to day “operational” expenses. I have one wallet for each of the major areas: Groceries, Utilities (propane/water dump), Treats, Etc. This way when I am buying groceries I can look in the wallet and know that this pile of cash has to last me till payday. This makes your budget tangible, as in you see it and yes, you make it work. I do have a contingency wallet that I can dip into between paydays to give a depleted wallet a small boost. I have drained this wallet completely though, and not been able to replenish it. It is a lower fiscal priority. I only use my bank card to pay for very specific expenses, such as fuel once a payday. I leave the money in the account to pay for automatic payments (that I still budget and account for). I still leave my bank card locked up so I can’t use it for impulse expenses. I also never use it for day to day purchases. This way I can predict what I will have left in my bank account by the end of the pay day cycle down to the penny. By being able to do this, I can budget successfully and move my fiscal goals forward. The top are my smaller goals and targets that I have set for myself. I have now laid them out so that they are in month-sized chunks. This is so I can see regular movement in these goals and achieve one of these per month. This is key to motivating myself to sticking with my overall plan and resist futility to set in. The goals go from left to right, with left being the next goal to be achieved and right being the last one to be achieved. Each time I achieve one I: pull it down, crumple it up, throw it away, and then move all of the other goals over one spot. At the start of the year I will have twelve goals up there and at the end of the year there should be none. Along the bottom is the current status of my three accounts. This is down here because it is the foundation of everything, all of my fiscal goals are founded on these three accounts. The main account shows what I have over my personal target of $1k. I deduct the $1k from the bank balance to display here so as to reinforce the concept that $1k is $0 in that account. As well, this is not the current balance in the main account, but what it will be once all of my automatic payments have been paid. The happy or sad face in the corner shows whether I am happy or sad with the status of this account. As in, am I on target or behind. The line in between the goals line on top and the account status line below is my bills and debts line. Some of these are bills to myself, and some are debts to be paid off. They are in the middle because they stand in the way of my goals, I must get rid of them if I am to achieve and pick up speed on my goals. Like with the goals, the order of importance and the one that I am targeting is the one on the left, then the one next to it, and so on. Each time one is paid off, it is taken down, crumpled up and the others are moved over. Once again, I am not bragging here, but I hope that this inspires you to do something similar. I have found that having these notes in my face reinforces: where I am, where I want go to and what I what I need to do to get there. Not only that but they motivate me to stay on track.